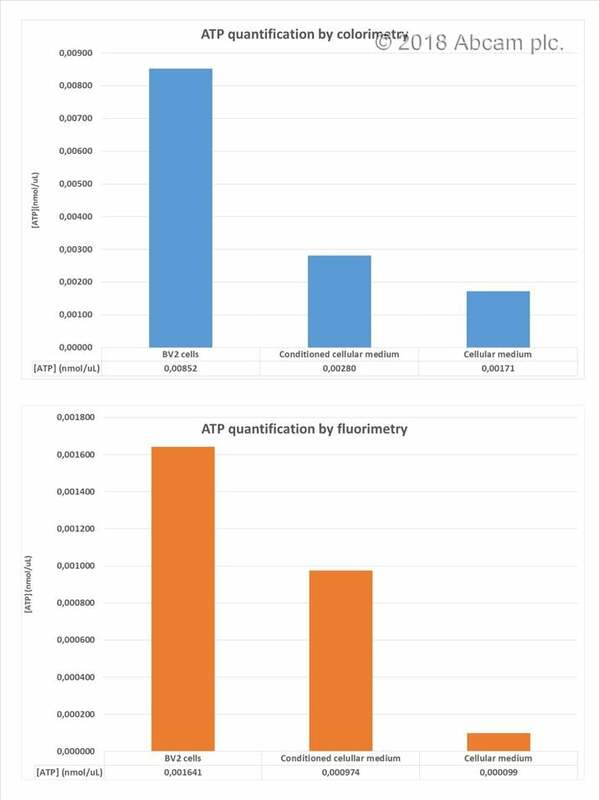 ATP Assay Kit (Colorimetric/Fluorometric) (ab83355) use a robust, simple method; the ATP assay protocol relies on the phosphorylation of glycerol to generate a product that is easily quantified by colorimetric (ODmax = 570 nm) or fluorometric (Ex/Em = 535/587 nm) methods. This kit can detect as low as 1 µM of ATP in various samples. If you require a more sensitive product, we recommend Luminescent ATP Detection Assay Kit (ab113849), which can detect as low as 1 pM of ATP. The chart shows a comparison of ATP levels of HepG2 treated with 0, 10 and 100 µM for 48 hours, DRH2O2 W1 (damage recovered cells using hydrogen peroxide with a recovery time of one week) HepG2 cells and MDA-MB-231 cells treated with 0, 10 and 100 µM of NaHS for 48 hours. Data is shown as percent of ATP levels in untreated cells. 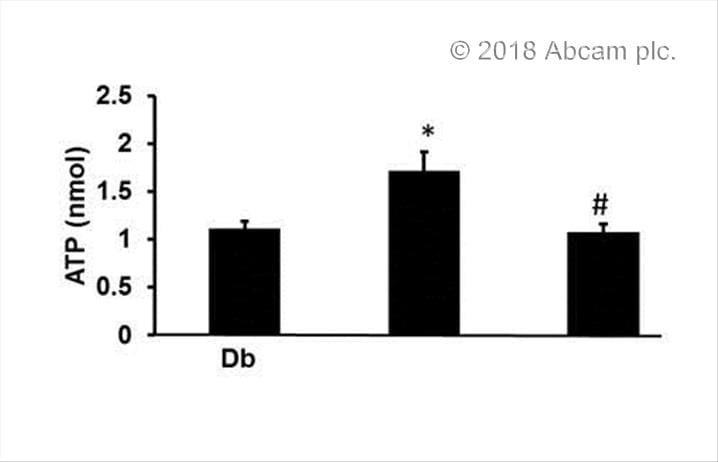 ATP levels were determined using ATP assay kit (ab83355). ATP assay performed with ab83355Image from Shi Z et al., PLoS One 9(8), Fig 2 doi: 10.1371/journal.pone.0105675. MCF-7 cells are transfected with vector, osteopontin-a, osteopontin-c or osteopontin -a plus -c. Cells are plated on poly-HEMA and seeded at 4 x 105 cells per well and incubated for two days under standard culture conditions. ATP levels are measured using ATP assay kit (ab83355). Example of fluorometric ATP assay standard curve. Example of colorimetric ATP assay standard curve. Quantitation of ATP in fish liver (2.5µl of 10 times diluted sample), fish muscle (5µl of 10 times diluted sample) and Jurkat cell lysate (5 ul) using fluorometric assay. Samples were spiked with known amounts of ATP (300pmol). Publishing research using ab83355? Please let us know so that we can cite the reference in this datasheet. I tried many different products to get better ATP measurements in Heart tissue of mice but failed then I bought abcam ATP Assay Kit (Colorimetric/Fluorometric) (ab83355) to measure ATP content in heart tissue of mcie which was knockout to PGC1 alpha, as recommended in their datasheets and I never had any problem with it. I got very important data which I used for my research article. I think its great kit to use and have everything in it. I think this is best product to detect ATP content. We are interested in cuantifying the amount of ATP released to the culture media from primary astrocytes and microglia BV2 after their treatment with different compounds. To that end, we collected the media (DMEM with 1% of penicilin/streptomicin and 4mM of L-glutamine, but without phenol red) and froze them in liquid nitrogen. When we proceeded with the quantification, we thawed the samples on ice and centrifuged them at 13,000 xg for 10 minutes, without applying any deproteinization step. After this, we went on with the assay. We tested the two methodologies available: colorimetric and fluorimetric. Using cells as positive control, we obtained signal by both procedures, but fluorimetric's was the most sensitive, with the hightest signal/background ratio. We knockdown a protein which we are studying to effect the cell proliferation. 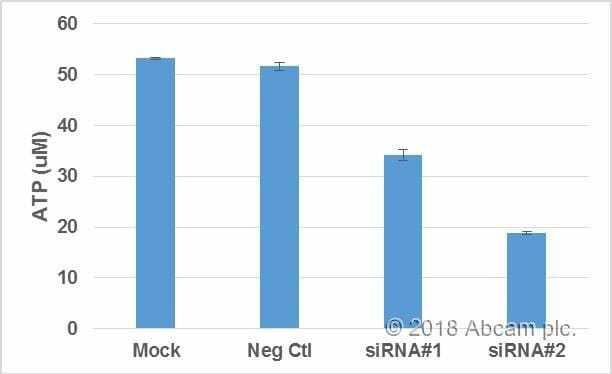 siRNA knockdown showed significant reduction in ATP generation in cancer cell lines. We are actually working on the preservation of rat pancreas from ischemia-reperfusion injury that occurs during the retrieval of the organ before a transplantation to a recipient. We are looking for strong ischemia markers and we know from literature that ATP level in pancreatic islet before is a good marker to predict transplantation outcomes (Jae Hyeon K et al., 2009. Transplantation). We extracted ATP from fresh pancreas that have undergo different time of cold ischemia : 0, 2, 4, 6, 8 and 10h. We also extracted ATP in situ. ATP were extracted in Perchloric acid (PCA-2M) and grind using a Polytron. PCA were removed using potassium hydroxide (KOH – 2M) and pH was adjust around 7-8. Samples were conserved at -80°C before utilization. 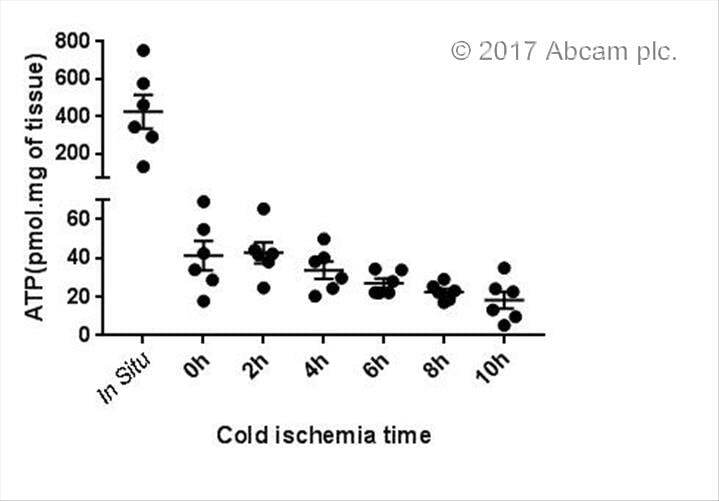 We obtained concording results with literature : a decrease of ATP level in pancreas with time of cold ischemia. This assay is working on pancreatic rat tissue.